A genetic variant that increases the risk of a common type of stroke has been identified by scientists in a study published online in Nature Genetics on February 5, 2012. This is one of the few genetic variants to date to be associated with risk of stroke and the discovery opens up new possibilities for treatment. Stroke is the second leading cause of death worldwide (more than one in ten of all deaths, and over six million deaths annually), and also in developed countries is a major cause of chronic disability. As the world's populations age, the impact of stroke on wellbeing is likely to increase further. Several different mechanisms underlie strokes. One of the most common types is when blood flow is impaired because of a blockage to one or more of the large arteries supplying blood to the brain – large artery ischemic stroke. This accounts for over a third of all strokes. Researchers from St George's, University of London and Oxford University, working with scientists from Europe, America, and Australia, in one of the largest genetic studies of stroke to date, compared the genetic make-ups of 10,000 people who had suffered from a stroke with those of 40,000 healthy individuals. The study was funded by the Wellcome Trust. The researchers discovered an alteration in a gene called HDAC9 which affects a person's risk of large artery ischemic stroke. This variant occurs on about 10 per cent of human chromosomes. Those people who carry two copies of the variant (one inherited from each parent) have nearly twice the risk for this type of stroke compared to those with no copies of the variant. The protein produced by HDAC9 is already known to play a role in the formation of muscle tissue and heart development. However, the exact mechanism by which the genetic variant increases the risk of stroke is not yet known. Henry Ford Hospital researchers in Detroit, Michigan, together with collaborators, have identified for the first time two molecules that together hold promise as a biomarker for measuring cartilage damage associated with osteoarthritis. Researchers say the concentrations of two molecules called non-coding RNAs in blood were associated with mild cartilage damage in 30 patients who were one year removed from reconstruction surgery to repair an anterior cruciate ligament, or ACL, injury. The findings are described as significant in the ongoing and tedious search for biomarkers for osteoarthritis, the most common form of arthritis that afflicts an estimated 27 million Americans aged 25 and older. It is caused by the normal aging process or wear and tear of a joint. The study was presented February 4, 2012 at the annual Orthopaedic Research Society conference in San Francisco. "Our results suggest we have identified a long-awaited biomarker for this leading cause of disability," says Dr. Gary Gibson, director of Henry Ford's Bone and Joint Center and the study's lead author. "For various pathology reasons associated with the variability of the disease and challenging blood biochemistry, developing a biomarker for osteoarthritis has been very elusive. But we believe our work shows great promise. The next step is to expand the number of patients studied and determine whether the degree in blood concentration can determine if the cartilage damage will worsen over time. Our ultimate goal is to develop a biomarker that can be used in the development of future treatments to prevent the progression of the disease," he added. The study, a collaboration of Henry Ford, the University of Guelph in Ontario, and University of Toronto, involved 121 Canadian patients from 2006-2011. For the first time, scientists have tracked the activity, across the lifespan, of an environmentally responsive regulatory mechanism that turns genes on and off in the brain's executive hub. Among key findings of the study by National Institutes of Health (NIH) scientists: genes implicated in schizophrenia and autism turn out to be members of a select club of genes in which regulatory activity peaks during an environmentally-sensitive critical period in development. The mechanism, called DNA methylation, abruptly switches from off to on within the human brain's prefrontal cortex during this pivotal transition from fetal to postnatal life. 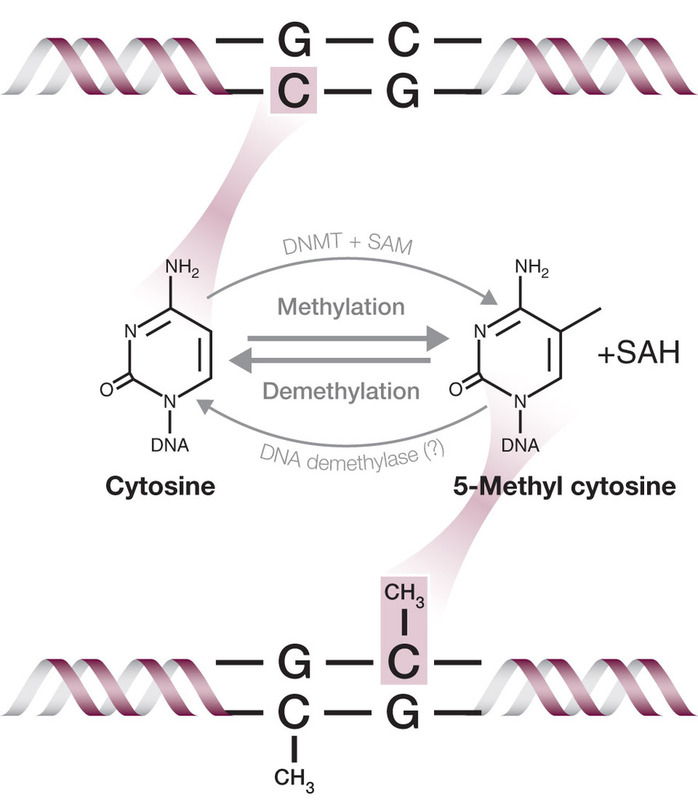 As methylation increases, gene expression slows down after birth. Epigenetic mechanisms like methylation leave chemical instructions that tell genes what proteins to make –what kind of tissue to produce or what functions to activate. Although not part of our DNA, these instructions are inherited from our parents. But they are also influenced by environmental factors, allowing for change throughout the lifespan. "Developmental brain disorders may be traceable to altered methylation of genes early in life," explained Dr. Barbara Lipska, a scientist in the NIH's National Institute of Mental Health (NIMH) and lead author of the study. "For example, genes that code for the enzymes that carry out methylation have been implicated in schizophrenia. In the prenatal brain, these genes help to shape developing circuitry for learning, memory, and other executive functions which become disturbed in the disorders. Our study reveals that methylation in a family of these genes changes dramatically during the transition from fetal to postnatal life – and that this process is influenced by methylation itself, as well as genetic variability.